I was recently stopped in a Deltaville coffee shop (Café by the Bay) and asked about The Dog and Oyster logo on my new, white, unstained ball cap. “Is that a new restaurant?”, the curious woman asked. “No, it’s a winery,” I said. I went on to explain how the former White Fences Winery just across the river in Irvington was recently sold and renamed, and we had just visited for a tasting the day before. My ball cap was an impulse buy when I was paying for two bottles to take home – a Chardonnay and a Merlot. Jenny and I had such a great time there that I wanted a memento of the occasion. I even gave the owner, Dudley Patterson, my old ball cap promoting a Richmond law firm where one of his attorney friends apparently worked – and I refused the quarter he was willing to pay! So, why the name? According to Dudley, the first half of the name honors the half dozen or so rescue dogs that were offered a good home at the vineyard along with a job – protect the grapes! Deer can wreak havoc on crops, including grape vines. 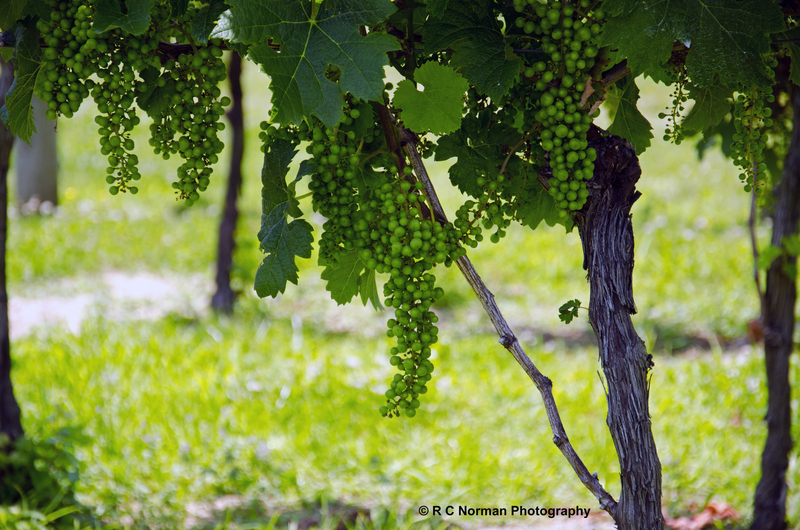 Larger vineyards just factor those losses into the expense of wine making. Smaller vineyards, like this one with only six acres of vines, can’t afford crops damaged by deer and other pesky animals. The dogs, mostly beagles and hounds, prevent that from happening. The second half of the name honors the bivalve mollusk considered to be one of the tastiest delicacies of the Chesapeake Bay and perhaps the greatest asset of the Northern Neck region, where The Dog and Oyster Vineyard is located. Probably the most notable feature of this vineyard are the two 40-foot cork screws that flank the entrance. Whether they are the largest in the world is still unconfirmed, but I would love to see the bottle these could open! 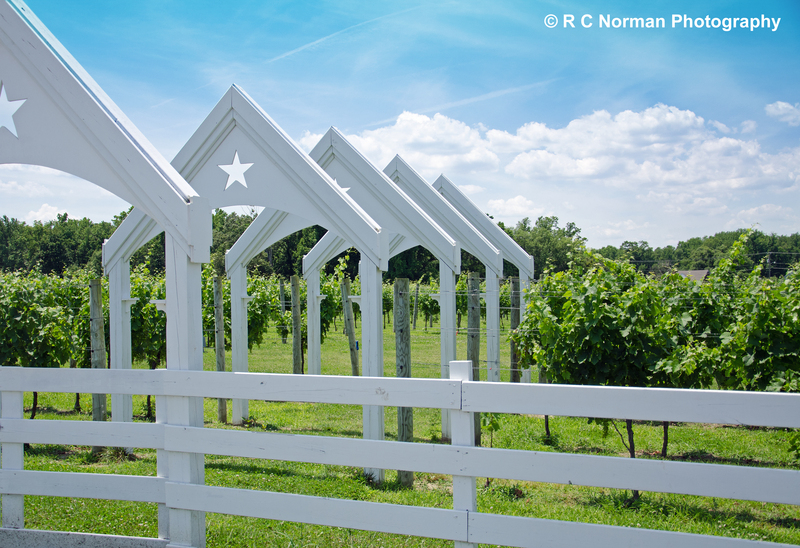 The tasting room is small, but charming – a white frame building with a big screened porch that sits in the middle of the vineyard. When we arrived, Dudley was just starting a rotation with a few other couples sitting at picnic tables on the porch. He called to us through the screen to come and join them. In between tastings, he told stories. I’ve already shared the one about the dogs. He shared another story about how the region is very similar to Bordeaux, with sandy, rocky soil and a high water table that needed an underground drainage system before the vines could be planted. The tasting was friendly and relaxing, and the wines were very good. The Dog and Oyster has partnered with Ingleside, one of Virginia’s largest wineries and likely the best known on the Chesapeake Bay Wine Trail. Four of the six wines offered in the tasting were Ingleside labels – 2010 Pinot Grigio, 2008 Sangiovese, 2005 Cabernet Sauvignon, and a 2007 Petit Verdot (my favorite). I like the bold wines, and this one was intense with a deep garnet red color and elegant aromas of vanilla and oak. The other two wines carried The Dog and Oyster label – a Chardonnay that was light and crisp, and a Merlot made in the European tradition with flavors of black cherry, currant and tobacco. We took home both of these. Dudley and his wife Peggy also own the Hope and Glory Inn just up the road from the vineyard. This highly-acclaimed boutique hotel of six rooms and 10 cottages is touted as one of the best small inns in America and continues to score high marks from Fodor’s and Frommer’s Travel Guides and numerous other publications. Jenny and I have added the Hope and Glory Inn to our list of places to visit. Dudley says future plans for The Dog and Oyster include food stands serving up – you guessed it – oysters and gourmet hot dogs, complete with wine pairings. 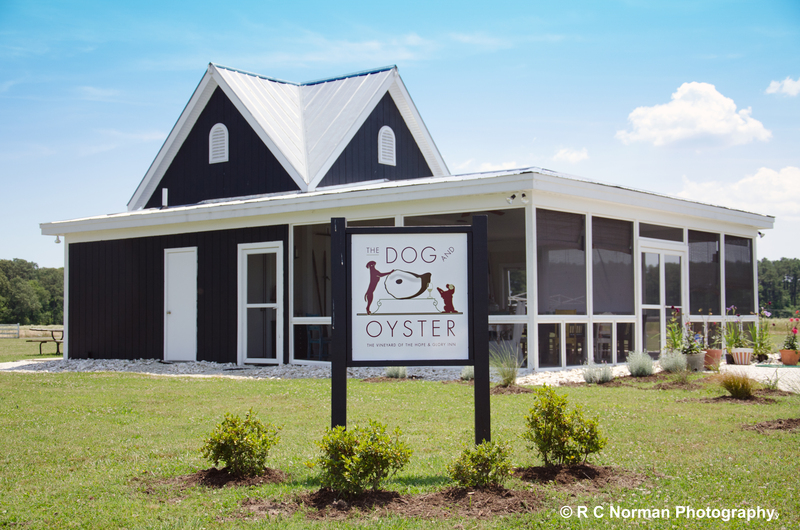 So, if you’re in the region and want to visit a dog-friendly, Chesapeake Bay vineyard with tasty wines and good stories in a relaxing setting, check out The Dog and Oyster in Irvington, Virginia. We’ll certainly be back soon.